SaveBroomhillPool.org | Why Save Broomhill Pool? We believe that there is undeniable evidence, to demonstrate, that restoring Broomhill Pool should be the top priority for IBC’s future leisure and cultural strategy. A restored Broomhill can deliver community cohesion - and access to healthy pursuits - in a deserving area of Ipswich. The public would like to see the grade 2 listed lido restored. The facility does not have significant structural defects. It can be restored, with 9 months work, at an estimated cost of just £3.9m for a basic restoration (with up to 50-75% possibly coming from non-taxpayer funding). The pool can run without a loss. The pool is East Anglia’s only 50m+ outdoor lido. It will be heated. Broomhill Pool is an economical, practical asset and can be a unique attraction for Ipswich. The pool facility can be used for a multitude of leisure and cultural pursuits, benefiting the taxpayers of Ipswich; such as outdoor swimming, diving, canoeing, sub-aqua, wind-surfing, dinghy sailing, triathlon, water polo, model boating, outdoor theatre and arts, as well as providing a safe, secure, supervised social meeting place. 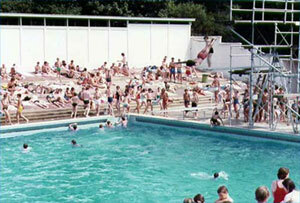 East Anglia’s last 50+ metre outdoor pool (165 ft x 60ft complying with all 1938 A.S.A & A.D.A requirements). Originally heated to 70f/21c until the boilers were requisitioned for WW2. A restored Broomhill will have sustainable and economical energy heating; and could open 6-9 months pa.
Just one of seventeen Grade 2 listed lidos in Great Britain. East Anglia’s last Grade 2 listed lido. East Anglia’s last outdoor diving boards (believed to be the last surviving set of Wicksteed diving boards in the world). Ipswich’s last “modern” style public building. A heritage goldmine; cherished and loved by Ipswich people. The original birth place of Ipswich Town Football Club who played their first matches 1878-1888 before moving to Portman Road. The land was owned by the Sherrington family who founded Ipswich Town Football Club. The land was sold to the Borough of Ipswich for park land in 1925. The pool is built within Broomhill Park. Sherrington Road is named after Ipswich schoolboy Sir Charles Scott Sherrington who won the 1932 Nobel Prize for medicine; and became OM (Order of Merit, one of Britain’s highest honours). He lived at Valley Road. We must ensure that this wonderful pool is saved from demolition, for today's and future generations.